Provide comfort for the family of Herbert McKinney with a meaningful gesture of sympathy. Herbert Webster McKinney, age ninety-two, passed away Sunday, February 10, 2019, at the Fellowship Home at Cordelia Manor. A native of Crisp County, Webster was the son of the late LaFayette McKinney and Ola Mae Bridges McKinney. He was a World War II veteran and a member of the invasion forces sent to Japan. 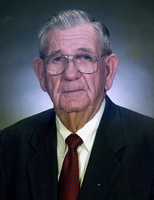 Webster was a local farmer and business owner and served for several years as a director of Cordele Banking Company. He was a loving husband and devoted caregiver to two wives, Margery Grimsley McKinney and Elizabeth Wade McKinney, both of whom preceded him in death. He was also preceded in death by his siblings, Helen Davis, LaFayette McKinney, Jr., and Janie Kate Mathews, and his son-in-law, Ferrell Cofer. Webster was a member of Ebenezer Baptist Church where he served as deacon for many years. He loved hunting, fishing, and traveling. He will be remembered fondly for his sense of humor and his devotion to his family, his friends, his community, and his church. Webster is survived by his four daughters and three sons-in-law, Nancy Cofer, Claire and Phil Wehlitz, Sue and David Lindsey, and Helen and Jerry Hunt; two step-daughters, Rhonda Wade Clark and her husband Tony, and Donna Wade Hall; 12 grandchildren, 11 great grandchildren, and several nieces and nephews. Funeral services will be held at 3:00 on Tuesday, February 12, at Ebenezer Baptist Church. Interment will follow at the Ebenezer Baptist Church cemetery. The family will receive friends prior to the service beginning at 2:00 in the church. The family asks that memorial donations be made to Ebenezer Baptist Church, P.O. Box 9, Cordele, GA 31010. To send flowers in memory of Herbert Webster McKinney, please visit our Heartfelt Sympathies Store. Provide comfort for the family of Herbert Webster McKinney by sending flowers. He was a great man very generous with his garden. He will be missed .